Co. Londonderry: Aghanloo, Ballykelly, Bellanrena, Benone, Drum (2), Dungiven (2), Faughanvale (2), Feeny (2), Fore Glen, Fruit Hill, Gelvin, Glenshane, The Highlands, Keady, Lislane, Myroe, Newtown Limavady (2), Owenreagh, Straw. The Board also included 8 ex-officio Guardians, making a total of 32. The Guardians met each week on Monday. The population falling within the Union at the 1831 census had been 41,031 with divisions ranging in size from Keady (population 1,048) to Newtown Limavady itself (3,610). 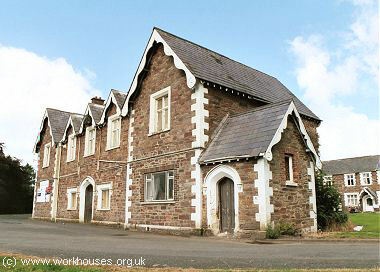 The new Newtown Limavady Union workhouse was erected on a seven-acre site at the south-east of Limavady. Designed by the Poor Law Commissioners' architect George Wilkinson, the building was based on one of his standard plans to accommodate 500 inmates. Its construction cost £5,982 plus £1,309 for fittings etc. The workhouse was declared fit for the reception of paupers on 15th March 1842 and admitted its first inmates the same day. The workhouse location and layout are shown on the 1907 map below. Newtown Limavady workhouse site, 1907. The buildings followed Wilkinson's typical layout. An entrance and administrative block at the west contained a porter's room and waiting room at the centre with the Guardians' board room on the first floor above. Limavady entrance block from the south, 2003. 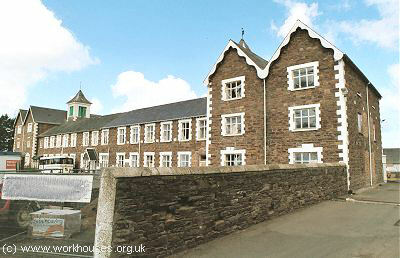 Limavady main block from the south, 2003. Limavady utility rooms, central spine and infirmary block from the south-east, 2003. Limavady infirmary block from the north-east, 2003. A long single-storey block of unknown function survives at the rear of the infirmary. Limavady from the east, 2003. 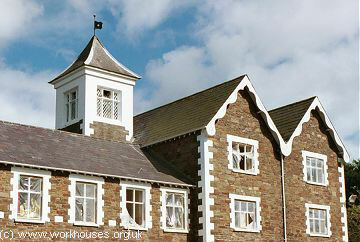 During the famine in the mid-1840s, a 30-bed fever hospital was erected at the north of the workhouse. There was a burial ground further to the north. At the 1901 census, the population of the Union was 20,623 with 12 officials and 106 inmates in the workhouse. In April 1930, the remaining inmates were transferred to the Coleraine workhouse with the Limavady site becoming a District Hospital, later known as Roe Valley Hospital. The site is now occupied by the Limavady Community Development Initiative, with with most of the original buildings surviving and renovated for other uses. Like a number of other former workhouses, Limavady has been the subject of reports of ghostly happenings such the sound of crying babies being heard in the area around the former maternity ward. The have also been reported sightings of a nurse in an old-fashioned cape with a red hood sitting on the bridge at the front of the hospital. Hospital nurses are said to have regularly heard at 3am what sounded like a nurse with a wooden leg. Public Record Office of Northern Ireland, 2 Titanic Boulevard, Titanic Quarter, Belfast BT3 9HQ. Holdings include: Board of Guardians' minutes (1839-1948); Dispensary minutes (1852-99); Master's journal (1844-1923); Indoor registers (1899-1940); Admissions and discharges (1911-48); Indoor relief list (1910-50); Contracts on boarding out (1911-45); Deaths (1856-1950); Births (1899-1935); etc. The Workhouses of Ulster by Michael H Gould (1983, Ulster Architectural Heritage Society).